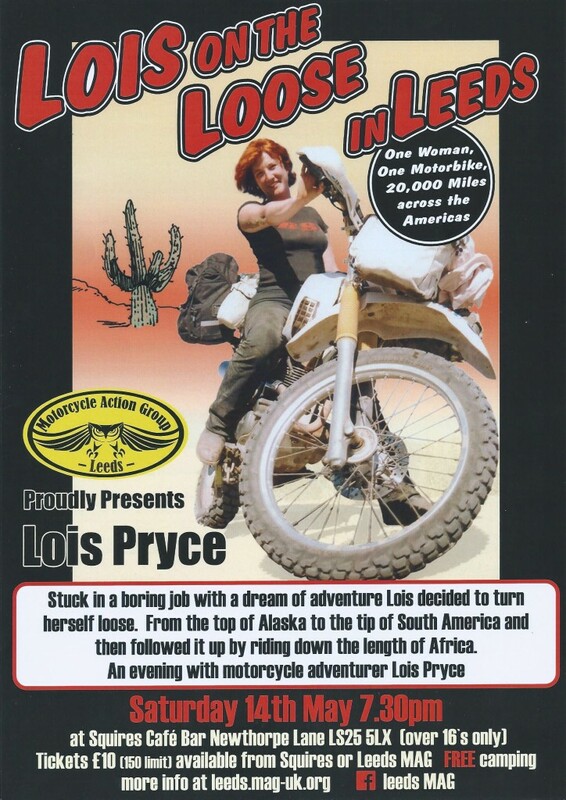 Following the success of our Evening with Austin Vince, we’re pleased to announce Lois on the Loose in Leeds, an evening with Lois Pryce. It will be held at Squires at 7.30 pm on Saturday the 14th May 2016. Stuck in a boring job with a dream of adventure she decided to turn herself loose. From the top of Alaska to the tip of South America, and then followed it up by riding down the side of Africa. Find out more about Lois on her website. Tickets including free camping will cost £10 from Squires or Leeds MAG meetings, or from our online shop for £10 each plus £2 postage.